Most aviation accidents, involving an airplane or helicopter, occur because of mechanical or equipment failures or because of the negligence of airline or airport employees. Airline companies have a special duty to safeguard passengers from serious injuries. When airlines fail to fulfill their responsibility, airplane accidents can occur, accidents that may require long-term medical care and result in serious and permanent disabilities. Negligence, on the part of an individual(s) or corporation(s), can be a major, contributing factor to an airplane crash. Unsecured food and beverage carts, negligent actions of flight attendants, and sudden loss of cabin pressure can cause flight injuries. Accident victims who sustain fatal or serious injuries due to an aircraft that fails to function properly may be eligible to seek compensation for injuries sustained. While no sum of money will make up for the loss of a loved one, The Law Offices of Henry M. Hanflik can help prepare you to face emotional and financial challenges. If someone close to you has been killed in an airplane crash, or you, a friend or loved one have been seriously injured in an aviation accident; you need an aviation accident lawyer who has the skill and knowledge to gather and to analyze all the evidence and build a strong case. The Law Offices of Henry M. Hanflik will fight for your rights and make certain that the responsible parties compensate you for your losses. Complete the online form for a free case evaluation or call the toll-free number 1 (888) 905-4632. 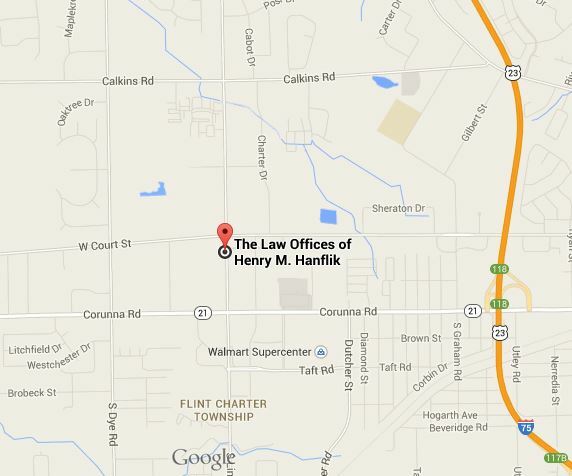 The Law Offices of Henry M. Hanflik.